Description: A mixed freight heads off of the Harrisburg fuel pad. 4 GP60's and a couple GE's sit in the engine facility. 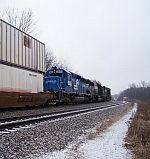 Description: A southbound heads towards CP Capital in Harrisburg, PA. Description: NS Eastbound Freight Train 334 ( Sheffield, Al. to Macon, Ga. ) passing through Calcis, Al. Description: Ex-Con gets a Frankenstein truck job. Description: 337 rolls south through Kannapolis with a Conrail SD40-2, leading a Southern SD40-2, and a repainted Conrail GP40-2. 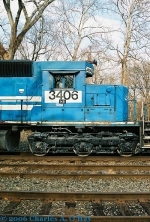 Description: another former Conrail sd40-2 sits with richmond's skyline behind her. Description: Detail of rear of NS 3406. Description: Rear truck on NS 3406. Description: Rear side of 3406. Description: Front truck of 3406. Description: Cab area of 3406. Description: Fuel tank of 3406. Description: Looks like the nose could use a little touch up.